Microsoft HoloLens Dev Edition recently became available in several additional countries. I’ve been using the HoloLens since August 2016. It’s still a development edition, but is the HoloLens Dev Edition worth buying? Is it worth 3000 dollars? I’m going to focus on my opinions on its usability to best inform you about the device as it is today. I’m not undermining the great advances and craftsmanship of the device, but I’d like to focus on one thing that I especially care about: long term use. Long term experiences that you will enjoy. Field of View is one of the biggest limitations about HoloLens. Field of View is what you see when you put on the device. In a 2015 article by Oliver from doc-ok.org, Oliver measures the Field of Vision to be 30 by 17 degrees. For comparison, the 2016 Oculus and Vive Virtual Reality devices both have 110 degrees for field of view. When you see YouTube videos with screen recording of the device, you see the camera’s full 120 by 120 field of vision. Not the 30 by 17 degrees. Low Field of View hurts usability. You typically have to focus on one hologram at a time or walk backwards until it fits your Field of Vision. You can imagine focusing on any enlarged hologram that is bigger than the Field of View. It feels limiting. Field of view is one of the consistent things that improves with AR and VR devices. There are options and research on different methods to create these displays. You can search Light Field Displays. Sparse Peripheral Displays. But as the HoloLens is today, Field of view does not feel great for extended use. HoloLens is completely untethered. No wires. It’s a completely independent device like your laptop or phone. And this feels great! How heavy is it? 579 grams. For those of you in the United States, it’s about 1.27 pounds. A pair of glasses on the heavier side can weigh 50 grams, meaning about a tenth of a pound. Think how a bicycle helmet feels on your head. A bicycle helmet like this one can weigh a pound. Could you wear that weight on your head for long extended periods of time? The HoloLens uses an adjustment wheel to tighten an inner headband around your head. You loosen the inner headband and then tighten it once you put on the device. You can bring the HoloLens display closer or away from your eyes with the headband. You can wear glasses! But every now and then, because I could be moving a lot, I found myself readjusting the device a little upward, so that I could see the very top tip of the Field of View better. You eventually master the inner headband. The headband does feel tight if I want the device to be stable on my head. Because of the combination of weight and tightness of the inner headband, your forehead and above your ears will get tired, so you won’t feel comfortable using the device for long extended periods of time. Having the device on your head for 30 minutes and more does not feel 100% comfortable. You’ll almost certainly want to take a break or readjust the device. You have 5 main controls without any bluetooth device: air tap, gaze, pinch, bloom, and voice commands. Airtap is where you tap the air. It’s like the left mouse click button on your computer’s mouse. Gaze is where you aim your head. It’s like moving your mouse on your computer. Pinch is mainly used like scrolling your mouse. Bloom is where you touch all your fingers of one hand together and open them outward. It is used to open the start button or exit an application. Air tapping, gaze, and bloom can easily be detected. But pinch can sometimes require a double take. Controls without a bluetooth device are limiting. You can only do so many things quickly and easily with these 5 control inputs. The great thing about HoloLens are bluetooth devices. HoloLens comes with a bluetooth clicker, but you can also use bluetooth Xbox One S controller, keyboard, and mouse. I like having these options. Without using bluetooth devices, the controls and variety of apps are lackluster for using the device for long periods of time. Your arm will get tired bringing it up and down to use the controls. The bluetooth clicker that comes with the device is a good addition. It does air tapping as a button, hold that button and you’ll do pinching, and pathing, but it’s not always reliable. 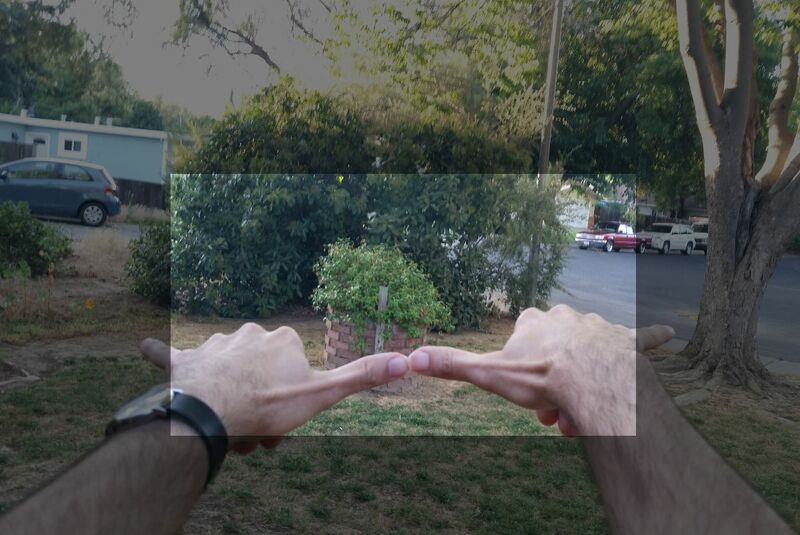 Great image quality. Good brightness. Holograms look nice! The device is built for indoor use. Outside, the lighting of the holograms will look different though. HoloLens will map a room as you look at your surrounding areas. Spatial Mapping is very neat for holograms interacting with the environment. The apps that take advantage of the spatial mesh of the walls, ceilings, and floor are phenomenal. Holograms will remain in the same area. If you put a hologram on the table it will still be there when you turn around. Depth works well. 3D audio sounds great. You can hear everything loud and clear. Think of surround sound speakers. The 3D audio on the device immerses you very well. Another great thing about HoloLens is that you’ll probably not feel nauseous. Augmented reality gives you the benefit of still being able to see real objects, which makes you feel more comfortable. Last but not least, battery life can be about 2.5 hours when pushed and used constantly and 4 or I’ve heard even 5 hours when not used intensely. Don’t worry about battery life because using it for 2.5 hours straight is a stretch. Power can last in standby mode for 2 weeks. I’ve left my HoloLens in standby for a week, and it was still ready to go. There’s 64 GB of Flash Memory, which is great space for apps. The Windows Store doesn’t have many HoloLens apps at the moment, considering that the device is still in development, but installing apps is as easy as it is on a phone. If you’re a developer and have plans to develop on AR devices like the HoloLens, the device is worth the 3000 dollars. In the future, HoloLens might be obsolete because a different company like Magic Leap might make a better device, but it won’t matter too much if you’re a developer. Developers will still likely use similar if not the same 3D engines or game engines to make their applications. If you have 3000 dollars to spare and only plan on being a user of the device, I don’t think that it’s worth the 3000 dollars. Save your money for the consumer version or rival devices. I’m looking for good ideas and your opinions on how AR can be better. Do you think that AR will eventually complement your computers and phones as an additional device used daily? What ideas for HoloLens applications or games do you have?